RSA Archer Suite is a global leader in the Gartner Magic Quadrant for integrated risk management. RSA empowers organizations of all sizes to manage multiple dimensions of risk on one configurable, integrated software platform. 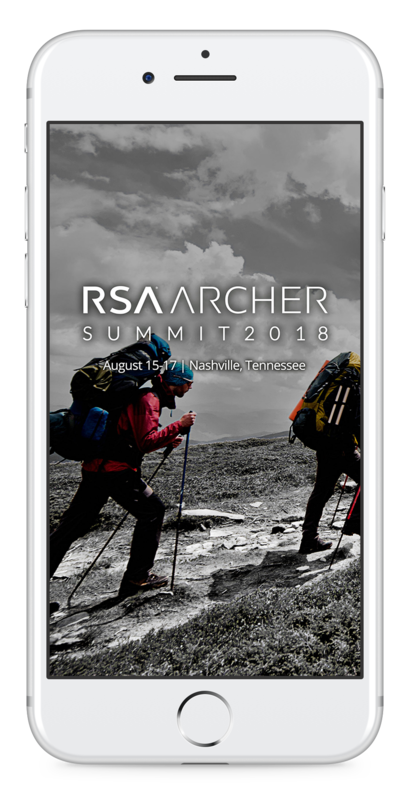 RSA subsidiary of Dell / EMC wanted to rapidly deploy an enterprise event mobile app that will ensure the delegates have the latest information at their fingertips. They required the app includes session and scheduling information, maps, event updates and much more with enterprise-grade security and rapid deployment. webMOBI has all-in-one event management software that offers comprehensive features for enterprises for conferences, sales kick-off meetings, AGM / Shareholder meeting, staff meeting, training, incentive trips, or large user conferences. webMOBI event app is ready to scale with your events, no matter the size or type of event. 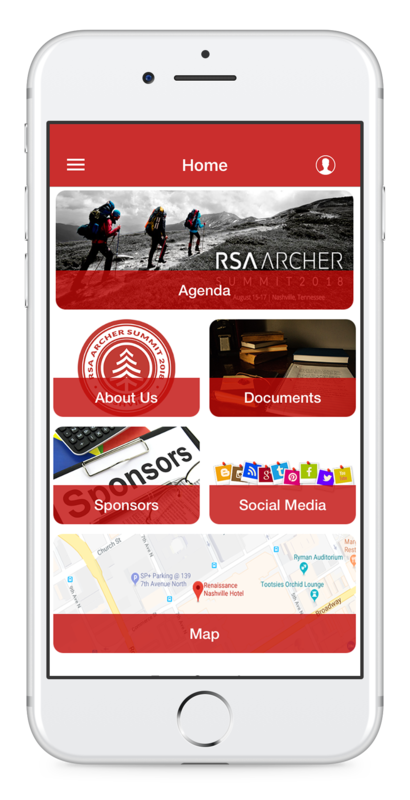 webMOBI deployed an Enterprise Event App for RSA Archer Summit 2018. The app allowed for attendees to obtain relevant information about the event and participate in surveys for session feedback. Here are some features and functions of the RSA conference app. This feature displays the event’s schedule in an intuitive interface for all the event activities. It includes information on speaker details, session descriptions and more. Attendees can also participate in session feedback after the session. This feature provides attendees a detailed account of the organizer’s history, objectives, and work, to allow users to understand the nature of the event and organization better. 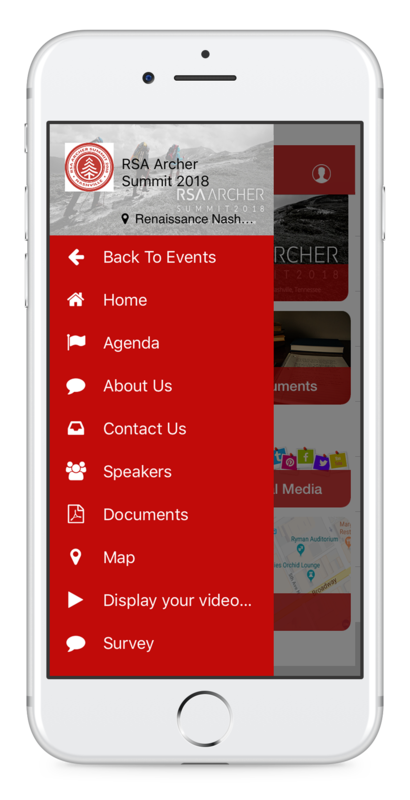 This section of the app helps provide attendees with all the organizer’s details in need of further contact or queries. Attendees can now share relevant and interest documents, session content in both document or video format. Event organizers can better gauge the attendees’ experience using surveys and obtain feedback instantly from the app based polling tools. Organisers and attendees can better gauge the sponsors of the conference, and maneuver their way through the list of exhibitors. The tool offers a comprehensive list of sponsors and exhibitors, to help enhance attendee interaction. This tool offers attendees to promote and continue communication regarding the conference even post the event, through Facebook, Twitter handles and hashtags, and Instagram. Do you want to learn more about using webMOBI enterprise event app builder to increase attendee engagement and networking? Contact support@webmobi.com or call us at +1-888-55-WEBMOBI. webMOBI has an all-in-one event management platform that offers website, registration, ticketing, and mobile applications. The features include a branded registration page, customizable check-out forms, ticketing and check-in application and suitable for large and small conferences/meetings/event app for enterprises. computer technology company. Renowned for its innovations in supply-chain management and e-commerce, Dell has revolutionized the ‘build-to-order’approach to manufacturing, enabling expedited delivery of individually configured PCs to customers around the world.